REI Ridge Trail Day – EVENT CANCELED DUE TO RED FLAG FIRE DANGER!!!! « Nature Hike at King-Swett Ranches – HIKE CANCELED DUE TO RED FLAG FIRE DANGER!! Ridge Trail Day: On November 3, hundreds of volunteers will join the Bay Area Ridge Trail Council and REI for the 11th annual Ridge Trail Day all around the Bay Area. 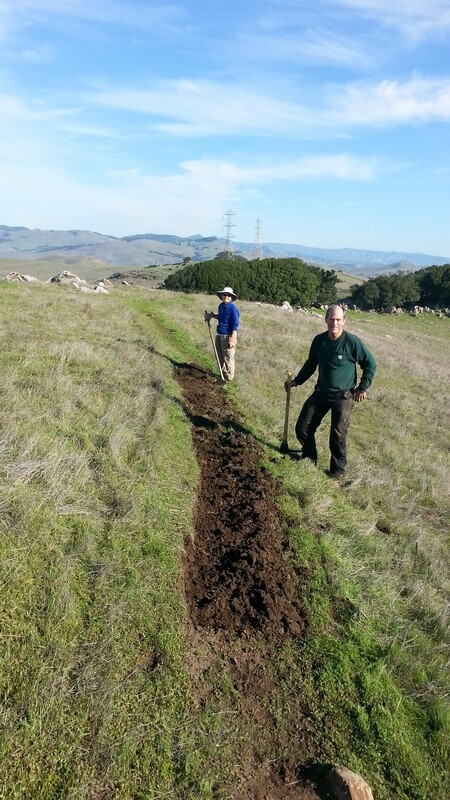 For our site location at American Canyon’s Newell Open Space Preserve, volunteers will join the City of American Canyon and Solano Land Trust for a Seasonal Wetland Restoration Project. Activities will include installing a fence around a mitigation pond to restrict cattle access in order to restore the functionality of a Seasonal Wetland for California Red-legged Frog habitat. *Please Note: volunteers will have the opportunity to work with barbed wire if they are inclined. All ages are welcome, volunteers under 18 must be accompanied by a legal guardian. EVENT CANCELED DUE TO RED FLAD FIRE DANGER! !